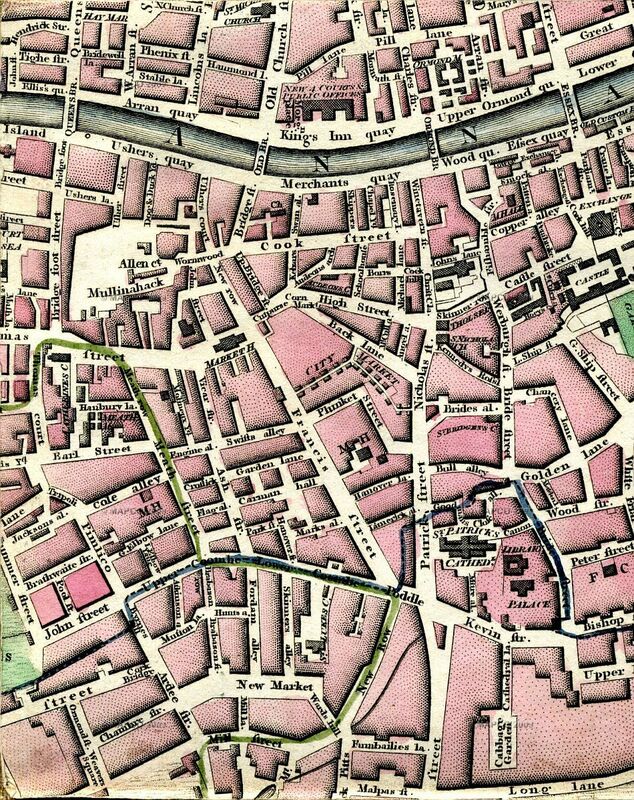 A dramatic account of gang violence in eighteenth century Dublin. | Come Here To Me! A dramatic account of gang violence in eighteenth century Dublin. At the minute, I’m slowly but surely working on a brief article looking at a riot that broke out in Dublin in 1759. A rumour of an impending ‘Act of Union’ with Britain was enough to bring a mob of hundreds to the Irish Parliament, where scenes of madness broke out, with claims that the mob had first assembled in the Liberties and that the infamous ‘Liberty Boys’ were in their midst. In the course of it all, I stumbled across a great account of the Liberty Boys and the Ormond Boys, which was in J.D Herbert’s exciting Irish Varieties, for the Last Fifty Years: Written from Recollections. Published in 1836, it’s an interesting if slightly over the top account of Irish characters in the late eighteenth and early nineteenth century. Below is his account of the faction fighting that occurred between the Liberty Boys and the Ormond Boys. These gangs were infamous in their day, and have certainly entered Dublin folklore. As I have got into a view of subjects so vile and low, that it would, perhaps, never have occurred to any person to record them had had they not been so annoying and offensive to the citizens of Dublin, that it was a risk of life to fall in their way when they were prepared for their abominable sacrifices; and, therefore, I having them strongly before me in recollection, could not, in truth, omit giving a hasty sketch of their actions. A set of fellows of the lowest description, frequenting Ormond Market, assistants and carriers from slaughter-houses, joined by cattle drivers from Smithfield, stable-boys, helpers, porters, and idle drunken vagabonds in the neighbourhood of Ormond Quay, formed a body of fighting men, armed with falchions as they called them- oak staves of casks hardened by smoking in chimnies, sharpened on one side, and a hole cut in one end to admit a hand to answer for a handle – some preferred shilelahs- but all armed for combat, were prepared to meet the Liberty Boys, a set of lawless desperadoes, residing in the opposite side of the town, called the Liberty. Those were of a different breed, being chiefly unfortunate weavers without employment: some were habitual and wilful idlers, slow to labour, but quick at riot and uproar. No two armies in ancient days could have felt more glowing spirit, inveterate hatred, or obstinate resolution, to die or conquer than those two parties of brutal combatants; and they could give no reason for their abominable destructive aversion to each other; but that of the Ormond should not subdue the Liberty, and vice versa with the other party. Unfortunately for the citizens of Dublin, the sabbath-day was fixed upon always for the awful conflict, and until this fight was over no person dare venture into the streets. There were several patches of waste ground near the environs, but at some distance from each other, and it was an inviolable secret on what ground they were to meet until the action had nearly begun. As soon as the discovery was made, notice was given to the chief magistrates, the Lord Mayor, sheriffs or aldermen which were nearest the field of battle; then a body of soldiers were, under the direction of one of those civil officers, led to disperse them, and often obliged to fire on them before they could put them to flight, as it was found the best plan, there was so much trouble and expense in imprisoning them and bringing them to trial. This monstrous evil, I well remember, lasted for years, and could not be, or was not put down until the police were established. Then the Liberty and Ormnd surrendered their liberties, and Dublin got rid of those plagues, the Pinking Dindies and the Liberty and Ormond Boys. In the forementioned conflicts many lives were lost, and innumerable fractures and mutilations. An eminent surgeon, Mr. Dearse, had so many of those wretched patients, that the practice enabled him to cure fractures of the skull, which might have failed under the usual treatment, he called them Ormond fractures. An entertaining Storymap on the gangs from Colm Keegan is worth a look too. Very interesting stuff dude, well put together too! Crikey. Maybe without the evolution of team sports – soccer, GAA, rugby, we’d all still be at the faction fighting at the weekends. If you frown at today’s girly football hooliganism read on, and watch the vid.